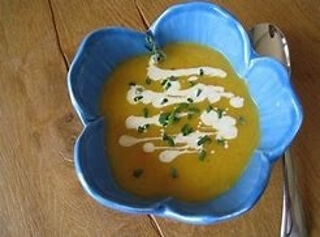 This Butternut Squash soup is a delicious and nutritious addition to any Thanksgiving dish! Coat the bottom of a large pot with avocado oil, and add the chopped vegetables and sauté until the leek is translucent, be careful not to burn the vegetables. Add 6 cups of vegetable stock and add a sprig of thyme. Simmer on low for about 40 minutes, or until all vegetables are tender. Remove the thyme before blending the soup. I like to use my Vitamix to blend it thoroughly, but a hand mixer will do the job too. Optional garnish: sour cream, fresh parsley, avocado, seeds, cheese, etc.